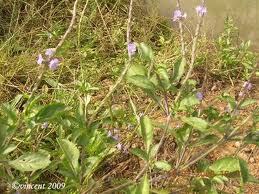 It is a small shrub has ovoid leaf with serrate, long petiole and blue colour flowers. Normally found in waste lands particularly rainy season. The ground leaf 5- 10 gm is given for dysentery. Boil leaf juice with equal quantity of gingelly oil and gently apply over body for skin diseases.